The title of this disc suggests that we get a programme as we have seen so many times on discs and in concert programmes: Italian chamber cantatas for soprano and basso continuo. That is not quite the case: all but one cantatas are scored for soprano, one or two obbligato instruments and bc. The inclusion of obbligato instruments is unusual indeed: Alessandro Scarlatti, the most prolific composer of chamber cantatas, composed 600 of them, and only 70 are employing instruments. The cantatas on this disc are even more remarkable because the instruments involved are the transverse flute and the oboe. It is telling that Carlo Vitali starts his liner-notes by dwelling on the subject of the role of these two instruments, and in particular the oboe, in the early 18th century in Italy. In France the oboe had become a common instrument in the 17th century. It was a standard part of the opera orchestra under Lully, playing mostly colla parte with the violins. In Italy the oboe made its first appearance in the orchestra of the San Marco in Venice in 1698. Here it replaced the cornett, which is particularly interesting in regard to the role it was going to play. The reason the cornett was in such high demand in the 17th century was its ability to imitate the human voice. This was exactly the quality which was attributed to the oboe. Vitali quotes the German theorist Johann Mattheson: "The Hautbois, after the Flûte allemande, is the closest there is to the human voice, when one treats it in the correct manner and in accordance with the practices of singing (...)". It is no wonder that the first teachers of the oboe were from France and Germany. Some of them worked at the Ospedale della Pietà in Venice, and soon various girls from this and other ospedali became skilled players of the oboe. This can explain the relatively large number of compositions for the oboe in the oeuvre of Antonio Vivaldi. He didn't use the instrument in his cantatas, though. He composed nine cantatas with obbligato instruments, but none of them has a part for the oboe. The transverse flute appears in one cantata: All'ombra di sospetto, which is included on this disc. The flute and the oboe disseminated across Italy pretty quickly. Vitali mentions the fact that while staying in Rome and Naples Handel composed various pieces with obbligato oboe parts. Apparently in both cities musicians were available who were able to play them. Francesco Mancini was from Naples; his cantata probably dates from between 1720 and 1725. Vitali also reminds us that several composers in the programme were living and working for some time in German-speaking lands, where they may have become acquainted with the flute and the oboe. One of them is Antonio Lotti who was born in Hanover where his father Matteo was Kapellmeister. He went to Venice to study with Legrenzi. He made a career there as a singer and an organist in the San Marco. He was also active as a composer of operas and wrote a large number of solo cantatas. In Ti sento, o dio bendato he deviates from the standard structure of the chamber cantata by including an arioso, which is the most remarkable part of this cantata, as it is filled with Seufzer. The disc begins with a cantata by Agostino Steffani who was born near Venice but moved to Germany at the age of 13 and stayed there most of his life. He made a major contribution to the development of opera in Germany. He has become especially famous for his chamber duets. Spezza, Amor is one of a collection of six Scherzi Musicali, almost the only pieces from his pen in the genre of the chamber cantata. The opening aria is especially nice because of the dialogue between the soprano and the oboe. In this cantata the bassoon also has an obbligato part. Antonio Maria Bononcini was the lesser-known brother of Giovanni; both worked for a number of years at the imperial court in Vienna. Antonio Maria more or less remained in the shadow of his more famous brother. Even so, he was greatly appreciated and in 1710 he was appointed 'composer to the emperor', with retrospective effect from 1707. When Joseph I died in 1711 he was succeeded by his brother as Charles VI. Neither Giovanni nor Antonio Maria received a new appointment at the court. For Antonio this was a blessing in disguise: he developed into a composer of operas in his own right. He moved to Modena in 1713, where he was appointed as maestro di cappella in 1721. Here he stayed until his death. It is assumed that the cantata Idol mio, mio bel tesoro dates from 1720 or a little earlier. The last composer is Domenico Scarlatti whose cantata Di Fille vendicarmi is probably the latest work on the programme, dating from c1730, when he worked in Spain. 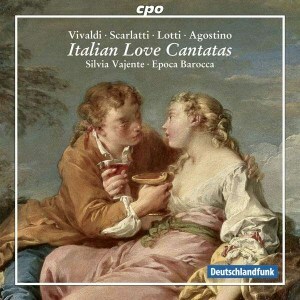 It is the only cantata on this disc for solo voice and basso continuo, without an obbligato instrumental part. It is quite remarkable for the many pretty wide leaps in the two arias. One may think that most cantatas have been recorded here for the first time. That is not the case. In fact, only the Bononcini has never been recorded before. Even so, this is certainly not standard repertoire, and the collection of these five beautiful cantatas is definitely something to enjoy. That is also thanks to the performances. I didn't know Silvia Vajente until recently when I heard her in a recording of Cavalli's opera La Rosinda (Ludi Musici LM 005; 2008). I liked her singing, and her qualities are confirmed here. She has everything needed to explore the content of this repertoire: a fine and agile voice, an excellent diction and articulation which results in a perfect delivery, and the awareness that the text always comes first. There is no wide vibrato here, she adds stylish ornaments and also takes the necesary rhythmic freedom in the recitatives. It seems that Ms Vajente and Epoca Barocca have found the right approach of this repertoire: these are chamber cantatas and the rather intimate atmosphere suits these cantatas well. The obbligato parts are nicely executed, in an effective dialogue with the voice. In short: this is a highly enjoyable release.